Housed in an Alamo Heights landmark beneath one of the few surviving Mobil Pegasus neon signs, Marcus Sloan and Shannon Hall’s “multi-category lifestyle store” tackles specialized gifting from various angles (jewelry, books, clothing, housewares, fragrance, etc.) 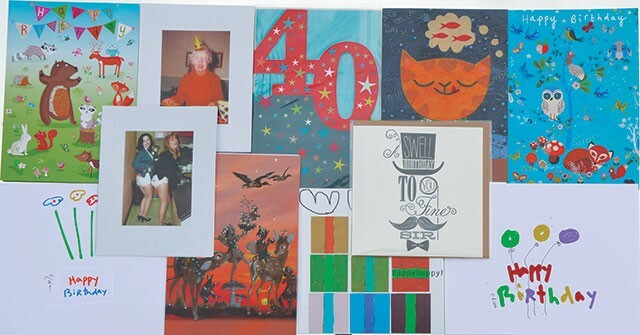 but truly takes the cake with its carefully curated wall of refined greeting cards. On a recent visit, standouts from the nicely varied birthday corner included hand-painted creations by Judy Barnes ($6), hip letterpress offerings from Elum Designs ($5.50) and MikWright greetings made from quirky vintage photos ($3.50). If the birthday boy or girl in question has a particularly naughty or campy sensibility, On Main Off Main might be the best choice.